Previously the chef of the Sunday Thai Menu at The Office pub on Sydney Street, there is a good chance some of you may already be familiar with Tookta’s Thai cooking. Going it alone, Tookta has her own colourful little café serving traditional Thai cuisine, tucked away on Spring Street, just off Western Road. She prides herself on using organic and fresh produce to create her contemporary, but authentic recipes. With careful attention to detail, Tookta promises to cater for all tastes and an appealing and thoughtful menu allows diners to tweak meals to suit their preferences. You can’t miss it, once on Spring Street; popping out from the sea of residential properties, Tookta’s purple exterior beckons you in. Inside, the café is warm, homely and inviting, with low lighting and candles on all the tables. The décor throughout is lovely: an interesting mix of Asian meets a more contemporary Brighton style. Tookta is one of the people who greets us this evening, and with a smile we are taken to our table and handed our menu. 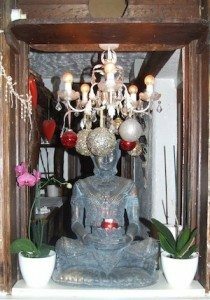 There is a great selection of curry dishes, stir fries (both served with rice) and noodles dishes; all mains can be served with mixed veg, chicken, beef, prawns, duck or mixed seafood. The starters are divided into two sections: starters and spicy starters, and consist of a good selection of seafood and vegetarian options. The menu also gives you the option to order your curry without coconut milk, should you prefer it less creamy. As we consider the dishes, we order some drinks. 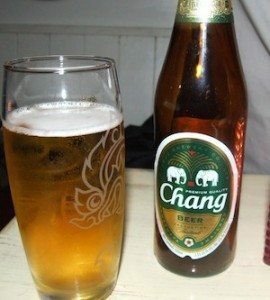 Although Singha seems to be the beer of choice amongst our fellow diners, my partner and I have a nostalgic attachment to Chang; so without much hesitation, two bottles of this are ordered. I pick the ‘spicy squid’ and for my main – with a two chilli indicator – ‘Bamee Nam’ (spicy noodle soup). My partner goes for ‘vegetable tempura’ to start and a duck ‘Panang’ – his all-time favourite curry – for his main. While we wait, we are bought a bowl of complementary crackers and a sweet chilli dip to enjoy alongside our beer. Very soon after that, Tookta’s starts to get very busy, this is obviously a very popular spot! 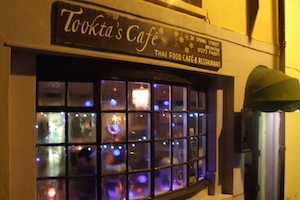 Attracting a variety of different diners, offering a takeout menu as well, Tookta’s Café seems to tailor for all needs: dinner on your way home from town, or a relaxed evening with friends or family. When our starters hit the table, the Café is really humming, reinforcing that Thursday really is the new Friday! Arriving promptly, these dishes are wonderfully good! 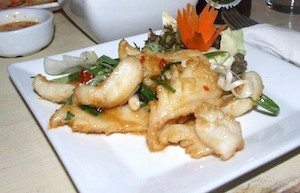 The spicy squid is lightly battered and tender; the sauce is sweet and spicy, with an impressive kick; I would have quite happily devoured another plate of this! The vegetable tempura includes a good variety of deep fried veg – with peppers, onions and broccoli among others – crispy and comforting, served with a lively sauce. When both plates are licked clean, we agree that our starters have been a resounding success and sit back to let them digest. 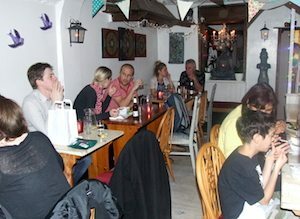 There is a little wait until our main, probably due to the growing number of diners Tookta is welcoming in this evening. I am grateful for this wait when I see the size of my main; not for the faint hearted, this is quite some bowl of soup! 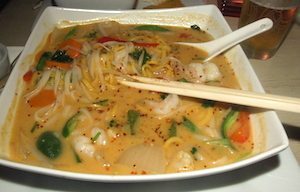 A mass of egg and rice noodles (I only ordered rice noodles, but I am happy with a mixture), with red curry, coconut, broccoli, bean sprouts, vegetables, and my chosen prawns. 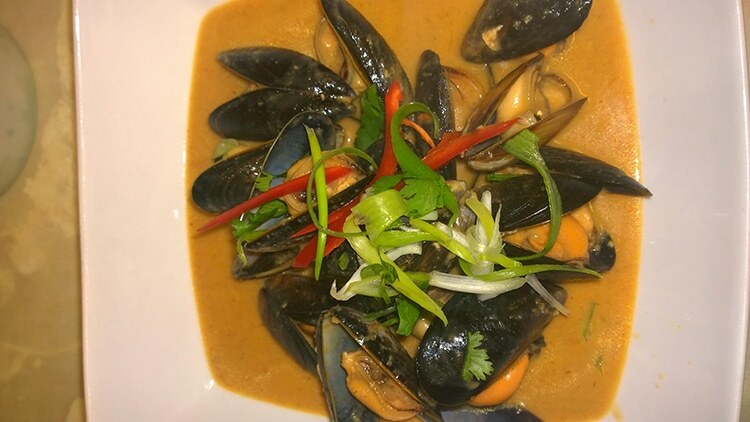 The sauce is a slightly lighter version of a classic red curry sauce, not quite as light as you might expect for a soup, but none the less, very tasty. I personally thought it may be a bit spicier (due to the name), but a side portion of dried chillies gives the dish the extra kick I am looking for. My partners Panang is incredibly thick and rich. His curry is full of flavour, a beautiful colour with notes of authentic lemongrass and Thai basil, and perfectly cooked veg. The duck works well with the other flavours and is a great partner to the Panang sauce. 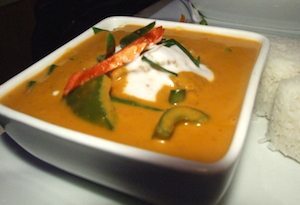 Giving diners the flexibility of being able to opt for less or no coconut milk in their curry, means that if you do prefer your sauce slightly less heavy, you are able to request this when ordering. Although the Panang is perfect for my partner, the portion size proves just that little bit too formidable and in the end we have to take home with us what we cannot finish. I am certain we will have room for the rest in a few hours and will enjoy it in equal measure! There are some great things about Tookta’s. The atmosphere and ambiance, make this a lovely place for an evening meal. The staff are attentive, if a little taken aback by the busyness this evening; having said that, they are thorough when explaining the dishes to ensure their customers are happy with what they select and consistently wear a smile. There are also a good number of regulars dining with us tonight; diners who clearly frequent Tookta’s, know her well and clearly hold her cooking in high regard. It is fair to say, Tookta’s passion for good food and a warm welcoming atmosphere, certainly comes across in the finer details of her café and her cooking!